Each week, as part of our Share Your Travel Love Bug competition, we hope to profile a different destination based on the travel experience of an actual Fly.com user. This first installment comes from Anna Tabakh in New York. I had the pleasure of venturing to the eco-tourism paradise of Costa Rica. Why did you want to visit that destination? Costa Rica first made it onto my travel radar when one of my friends decided to uproot her New York City life so that she could reconnect with nature and get away from the hectic lifestyle of urban dwelling. Fly.com thankfully gave me a gentle travel nudge by finding a flight deal that I simply couldn’t refuse. What was the Fly.com deal that got you there? My roundtrip flight was on Continental Airlines. I flew from Newark and arrived in San Jose (via Houston). My travel dates were March 2nd through March 7th. The final price came to $404.50 which included tax, and Fly.com directed me to priceline.com to make the purchase. How did you find your flight deal? I first stumbled upon my Newark to San Jose flight via Fly.com’s Today’s Best Fares newsletter. I then utilized the Fly.com Fare Calendars feature to find the cheapest days to travel. What was the highlight of your visit? 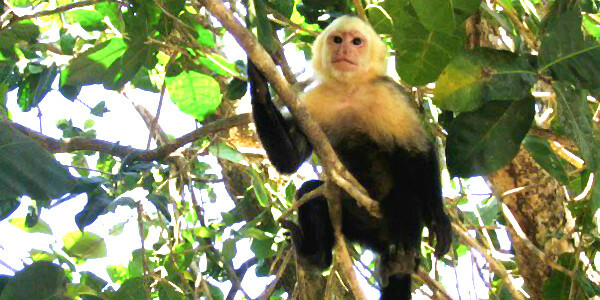 Having face-to-face time with playful Capuchin monkeys on the shore of one of Manuel Antonio National Park’s copious beaches. Which hotel did you stay at? It was my personal mission to find the highest rated, yet affordable accommodations in Manuel Antonio, with prime access to pristine beaches – with surfers being an added bonus. My research landed me at a lovely bungalow style property, Hotel Byblos Resort & Casino, which served as an ideal home, alongside monkeys, gators, and bountiful birds. What activities would you recommend to first time visitors? Costa Rica certainly outdid itself when it came to adventure. 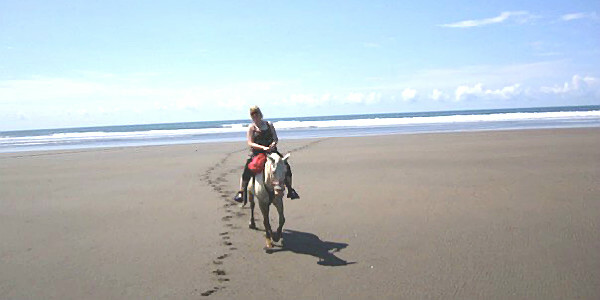 For first timers, I would highly recommend testing your hand at surfing (locals make for the finest instructors), horseback riding on the beach and zip lining through lush rainforest canopies. What is the one piece of advice you would share with other travelers visiting that destination? I would suggest waking up with the sunrise, so as to infuse as much exploration as possible into each day. Even though my muscles were sore after each outing (between the surfing, 25 mile bike ride in the mountains, hiking, zip lining and horseback riding), I couldn’t have asked for a more nature-filled getaway. Is there anything else you would like to add about your experience? The more I travel, the more I’ve realized that some of my finest gallivants have been of the spontaneous variety. That is why I love following Fly.com on both Facebook and Twitter. It helps me stay abreast of the latest deals they dig up! If you would like to write about a destination that you have visited using flights found on Fly.com, you can submit your travel experience via the Travel Love Bug button on our Facebook page, or by completing our Travel Love Bug questionnaire. For the official rules of the Fly.com Travel Love Bug competition, please click here. How To Get There: Juan Santamaria International Airport (SJO) is approximately 12 miles from downtown San José, and is serviced by 15 domestic and international airline carriers such as American Airlines, Frontier Airlines and United Airlines. There’s a bus that goes from the airport to downtown San José that takes approximately 35 minutes, and costs ₡535, approximately USD$1. Information regarding area transportation is available here. Best Time To Visit: Weather-wise, the best time to visit is December and April, which is the country’s dry season, with occasional rain. This is also the peak season for international tourists as well as local Costa Ricans, which means airfares and hotels prices are going to be higher at this time. If you’re looking for a bargain in terms of flights and accommodations, the cheapest time of year would be the rainy season between May and November. A secondary high season is June and July, a popular time for North American travelers.